The history of Peoples National Bank, chartered as a national bank in 1909, actually began in 1893, when a private firm called Peoples Bank was founded in McLeansboro, Illinois, by John H. Miller. Mr. Miller, a prominent businessman who later served as Speaker of the Illinois House, led the Bank until his death in 1907. In 1909 the trustees reorganized the bank and obtained a national bank charter as Peoples National Bank. In 1923 Peoples National Bank assumed a portion of the assets and liabilities of the Cloud State Bank, originally organized in 1871 by Chalon Cloud as a private bank under the name Hamilton County Bank. Peoples National Bank also purchased the Cloud State Bank building, which had been built by Chalon Cloud and his father, A.G. Cloud, in 1880-1882. The distinctive Cloud State Bank building had been designed by the Reid Brothers of Evansville, Indiana, who later designed the famous Hotel del Coronado near San Diego. Now on the National Register of Historic Places, this building is still the home of Peoples National Bank in McLeansboro, and has become a symbol of the long history of the Bank as a strong financial institution. In 2004 the Bank opened a new 28,000 square foot corporate/operations center in Mt. Vernon, Illinois. This facility acts as the nerve center of the fully digital operating system, which is designed, installed, and maintained by a skilled technical staff. This operations center, with its advanced technical capabilities, has given Peoples National Bank a competitive edge in providing services to customers throughout its growing market area. While other banks emphasize growth through an aggressive retail sales force, Peoples National Bank has concentrated on developing a highly professional staff that includes attorneys, accountants, and financial planners. Our expertise is in the development of innovative loan, deposit, and trust products with a full array of complementary secondary market sources and specialized governmental loan and guarantee programs. Peoples National Bank has now been in continuous operation for over 100 years, having survived even the Great Depression. 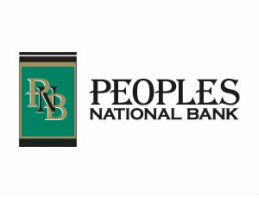 With assets of over $1.1 billion, Peoples National Bank continues to offer financial services that meet the needs of individuals and business owners. Information regarding the early years of Peoples National Bank was summarized from the book The Early History of Peoples National Bank, McLeansboro, Illinois by J. Michael Raley (McLeansboro, Illinois: The Peoples National Bank, 1994).